Welcome to KC Metal Works Online. We specialize in producing high quality band equipment tailored to your needs. We can handle any size project, large or small, and will build to suit. We manufacture practice field towers designed to fit your specifications. We deliver and, for an additional fee, will install it at your site. If you have a band trailer, we can customize the inside with shelving designed to fit your needs to make loading and unloading easier and more efficient. 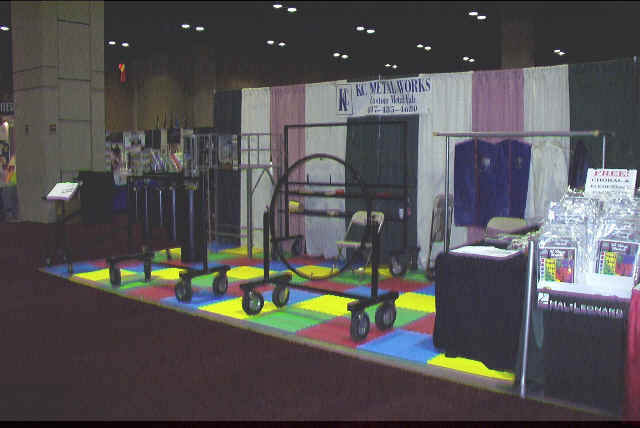 KC Metal Works was founded in 1996 by Kenny Caldwell. With 25 years of experience in the metal working industry and the knowledge gained by being a very involved band parent for 10 years, he decided to strike out on his own to build high-quality band equipment. This venture has been a successful one with the base of satisfied customers growing each month. Be sure to stop by our booth at the TMEA Convention in February and the TBA Convention in July! The conventions are at the Henry B. Gonzalez Convention Center in San Antonio, Texas. Please stop by our booth, we would love to hear from you! If you have any questions, please feel free to contact us by phone, fax, e-mail or postal mail. We will be happy to answer any questions you may have. Send mail to kcmtlwrk@swbell.net with questions or comments about this web site.